The ancient craft of saddle-making has kept up with the times; yet maintained many traditional practices. Early records of the Worshipful Company of Saddlers show that there was a Guild of Saddlers in London at least as early as 1160AD, probably earlier, which make it one of the oldest City of London Livery (trade guild) companies. Bob has worked as a saddler for over thirty years. A former jockey, and lifetime devotee of all things equestrian, he trained as a Master Saddler when his riding career ended. Bob has his own retail tack shop with adjoining workroom where he builds and repairs saddles, bridles, leather head collars, sets of harness and also makes his own range of dog collars and leads. He stocks a selection of well known brands of saddle and ‘off the peg’ bridles in the shop too. “A correctly fitted saddle is not an extravagance; I would say it’s a matter of priority.”Apart from the important issue of rider safety and comfort, an ill-fitting saddle can cause serious damage to an animal’s spine. Short term use can cause a horse to develop saddle sores, discomfort and stiffness in gait and reluctance to be tacked up and/or move forward. 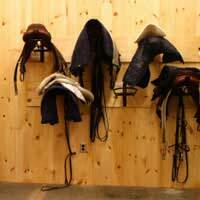 In Bob’s workshop there are several saddles in various stages of development along with other, brand name saddles, bridle pieces and stirrup leathers, in need of repair. Bob’s shop is run by a team of three equestrian-savvy sales people, including his wife, who cover the opening hours of 8:30am to 6pm, Monday to Saturday. He is then able to get on with the exacting process of saddle- making in (relative) peace, but is on hand to solve any customer queries and ‘show his face’ in the shop now and then! This morning Bob is re-flocking the final one of three saddles for a local show-jumping yard, ready for fitting tomorrow. He’s also repairing a martingale and various other pieces of tack, and will try to fit in an hour of design time for a new range of dog leads and collars. As with any job, there is the inevitable paperwork which has to be tackled daily. Client records, invoices, bills for materials, the shop accounts and staff wages are just part of it. “I pay a book-keeper to do the accounts, but have to keep organised with the day-to-day income and expenditure. I hate that part!” When Bob’s working day finishes, he and his wife exercise their horses and sometimes-on a warm summer evening-join friends in the village pub for a beer on the way home.